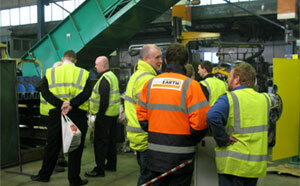 First Open Day of 2013 Was A Resounding Success! Customers and consultants were able to see our new ME2R150 Twin Ram Baler in action and discuss it’s capabilities with Middleton Engineering staff. A guided tour of the operation based in Meare near Glastonbury, including engineering shops, fabrication areas, design office and parts warehouse. Also provided a first-hand view of the high quality design and manufacturing carried out by our company which today supplies baling machinery across the UK to customers like The Co-operative, Biffa, Viridor and a number of local authorities. With a press force of 150 tonnes the new machine is the first British designed and built Twin Ram Baler. By integrating a pre-press Middleton is providing operators with a powerful machine that combines the high throughput of a conventional channel baler with the superior compaction rates of a twin ram machine. This results in denser bales and lower costs for the industry. In addition, this is the first machine to combine both wire and plastic tie capabilities in the same machine – the Dual Tying Head makes it very quick to switch from different waste streams such as cardboard, which requires wire ties, or RDF (Refuse-Derived Fuel) which utilises plastic. We expect to run a series of open days throughout the year, so be sure to book your place today! Mark Smith looks at issues facing the industry and the factors determining the right baling equipment. Making the environment a better place, with less waste to landfill, brings opportunities for innovative companies to process more ‘resource’ and grow. But the industry, including recycling equipment manufacturers, has its work cut out to keep up with the pace of change and Government targets. It also has to manage issues such as quality, especially in the areas of waste for export, and the growing cost of transportation and storage. Added to this is a dawning realisation that waste is a resource with real value, whether it is used as waste to energy or for the recovery of important raw materials. British manufacturers, for example, are already seeing damaging shortages of raw materials on world markets and are lobbying for clearer Government initiatives on the recovery of scarce resources. As experiences and procedures mature, the waste and recycling industry is starting to tackle more difficult materials. We are seeing the growth of new waste streams such as waste electrical and electronic equipment (WEEE) and hard plastics. This is set to become an enormous area fuelled by the rising tide of consumer electronics around the world – more than doubling by 2025. Dealing with these materials requires new flexibility in terms of the plant machinery used. Baling equipment in particular requires the ability to cope with the widest possible waste streams, including hard plastics and printed circuits. Many older machines are not able to achieve the compression required to produce suitable bales without costly pre-processing or shredding. And the industry is moving to bale more commercial and industrial waste, which requires more robust machinery. Few balers are created equal, so taking the time to assess your requirements is important to ensure operational efficiency for your MRF installation. Density of products to be baled and the tonnage to be processed will dictate the type and size of baler or balers that you need. 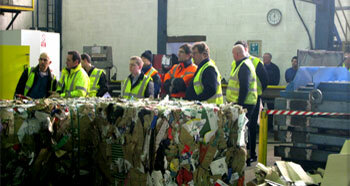 Speed of processing is also important, especially if there is limited storage capacity for incoming waste. If your baling equipment cannot keep up, you will quickly find the operation backing up. Operational constraints also need to be considered. Power limitations and space requirements should be checked, and you may even have time restrictions for running equipment to minimise nuisance to neighbouring communities. Above all, a proper test to trial your materials is crucially important. MIDDLETON Engineering, the UK’s leading baler and recycling equipment engineers, has won a second order from Scandinavia’s largest recycling company to export a Middleton HB60 Shear Baler to Denmark. Ragn-Sells of Sweden will be putting the new baler, which can process 6 tonnes of cardboard an hour, at the centre of their cardboard recycling programme in Copenhagen. Ragn-Sells, which collects, treats and recycles waste and residues from industry, organizations and households all over Scandinavia has chosen a UK baler because Middleton produces a “quality product, competitively priced that has good capacity” according to Bjørn Hoel, manager, Ragn-Sells. The first baler Ragn-Sells bought from Middletons in June, was modified with the addition of a hook lift so it could be mounted onto a lorry to provide a mobile baling service for cardboard and plastics around the Norwegian islands – vastly more efficient than transporting all the waste to a central depot. Hoel continued: “This is the second baler we have bought from Middletons because we wanted a robust, fully automatic machine, that is easy to operate and that requires a minimum of maintenance. It is particularly important that this second baler has low headroom and a small footprint so it can fit with the existing conveyor. MIDDLETON Engineering, the UK’s leading baler and recycling equipment engineers, announces that Stirling Council has bought their new state-of-the-art, Twin Ram Baler designed to help local authorities and waste management companies deal efficiently with wider waste streams. The Twin Ram Baler design of the Middleton ME2R80 will also produce heavier, denser bales of waste material, which in turn will help to optimise the increasingly expensive storage and transportation costs of waste recycling. Added flexibility and value for money were the key factors for Stirling Council Waste Services, which will take delivery of the first ME2R80 at its new Polmaise Recycling and Baling Facility near Fallin in Scotland during December. The council already achieves waste recycling of 57.4% and expects the new Twin Ram Baler machine to contribute to further reductions in waste to landfill. Middleton’s ability to produce a medium sized machine to cope with baling waste from Stirling’s 40,000 households, together with their quality of build and value for money formed part of the reasons they won the order from Stirling Council Waste Services. Other factors include Middleton’s ability to offer a bottle piercer, which is hydraulically retracted when baling other products and the provision of a bespoke feed chain conveyor with an above ground hopper designed to Stirling’s requirements.